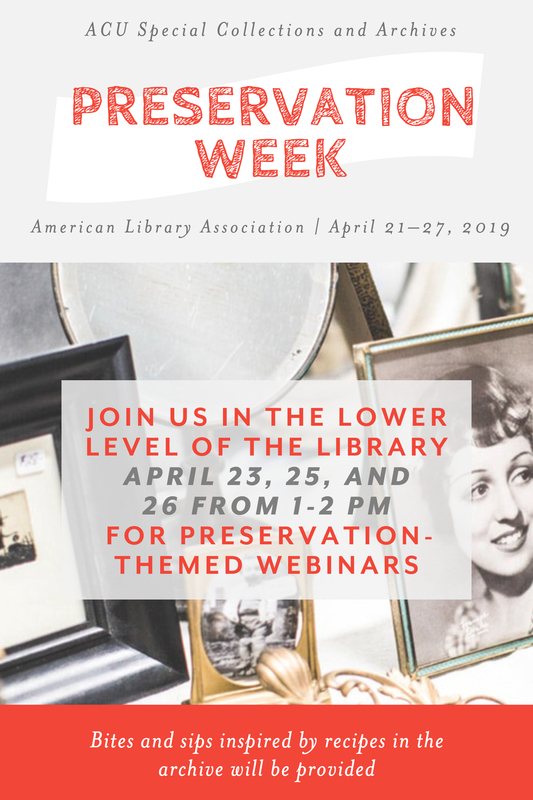 We will participate in Preservation Week 2019 by hosting three preservation-themed webinars in the Special Collections and Archives reading room on the lower level of the ACU Brown Library from 1-2 pm on April 23, 25, and 26. The one-hour webinars will focus on very practical strategies anyone can employ to preserve their family history. 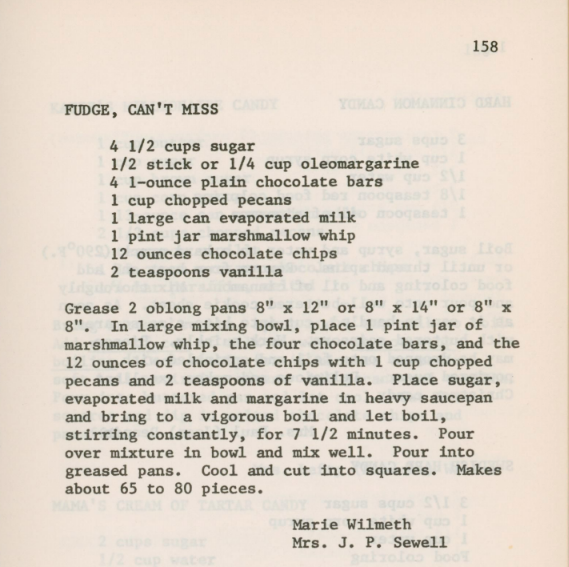 At each webinar we will feature three different recipes from the archives, primarily drawing on the 1974 Women of ACC Cookbook. If you’re in Abilene please come join us, and if you can’t make it in person we’ll share links so you can watch the webinars online. We will also share the recipes and some additional historical context about their authors. Below are the first three recipes we’re trying out– stay tuned for more! Below are the recipes we’ll feature on Tuesday, April 23. 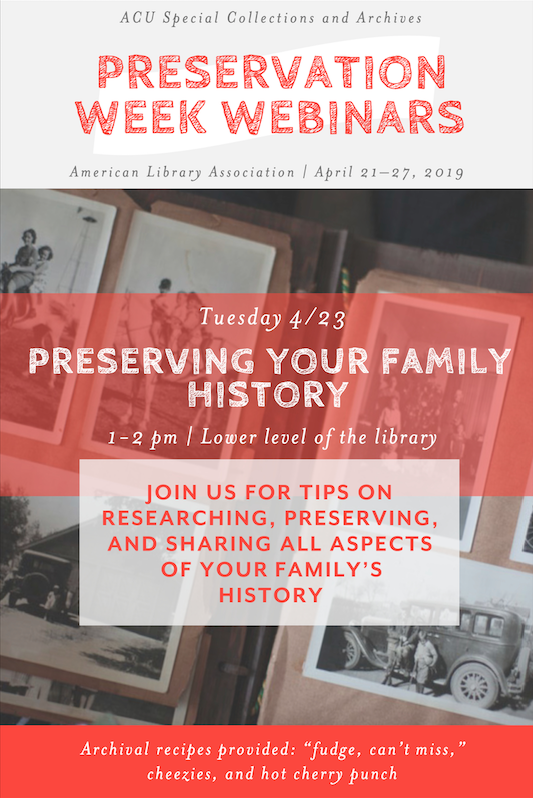 Join us from 1-2 pm to learn about preserving your family history. Abilene Christian College. Prickly Pear, Yearbook of Abilene Christian College, 1948, yearbook, 1948, University of North Texas Libraries, The Portal to Texas History, https://texashistory.unt.edu; crediting Abilene Christian University Library. 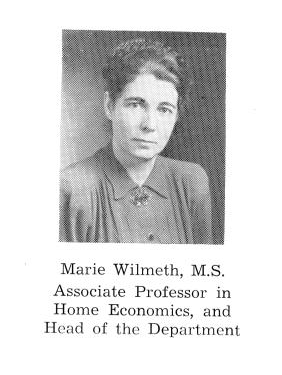 Thank you to Librarian Shan Martinez for sharing her research on Dr. Wilmeth. 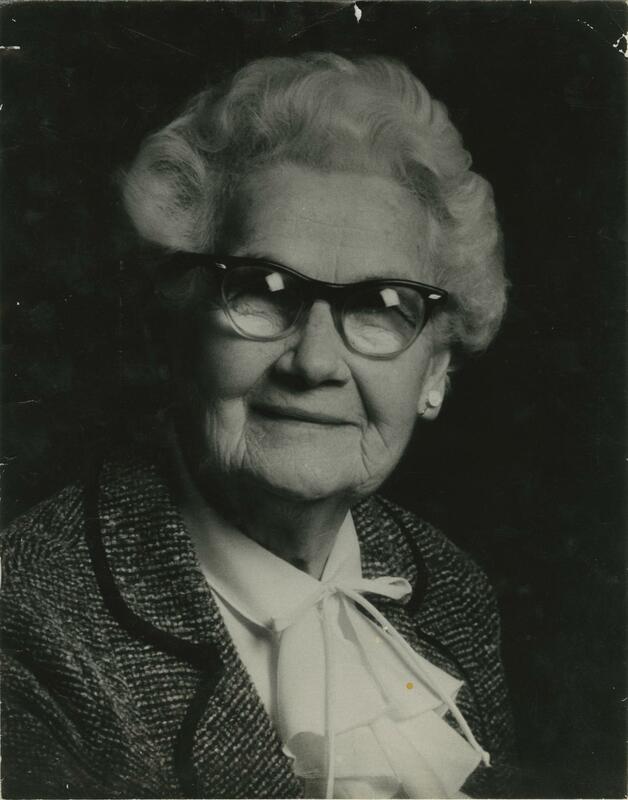 [Portrait of Mrs. Jesse P. Sewell], photograph, 198u, University of North Texas Libraries, The Portal to Texas History, https://texashistory.unt.edu; crediting Abilene Christian University Library. Page 158, Women of ACC. 1974. Women of ACC cookbook: recipes from members, ex-students and friends, and ACC specialities. Abilene Tex: Abilene Christian College. 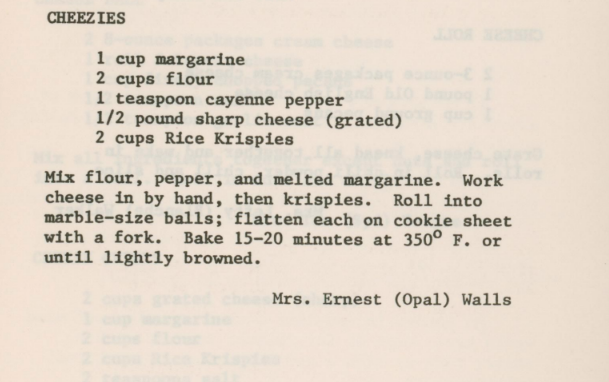 Opal Kathleen Sloan Walls contributed this recipe shortly after she and her husband, Ernest Walls, moved to Abilene in retirement to be near family and friends. Abilene Christian College. 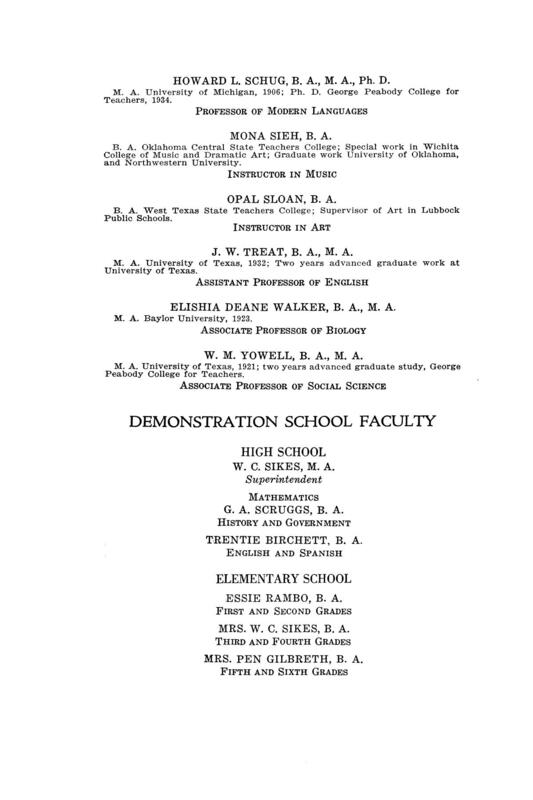 Catalog of Abilene Christian College, 1938, book, February 1938; Abilene, Texas, University of North Texas Libraries, The Portal to Texas History, https://texashistory.unt.edu; crediting Abilene Christian University Library. Opal (Sloan) Walls taught children’s literature and art methods at Abilene Christian College for several summers during the 1930s. The Optimist (Abilene, Tex. ), Vol. 78, No. 48, Ed. 1, Friday, March 30, 1990, newspaper, March 30, 1990; Abilene, Texas, University of North Texas Libraries, The Portal to Texas History, https://texashistory.unt.edu; crediting Abilene Christian University Library. Mrs. 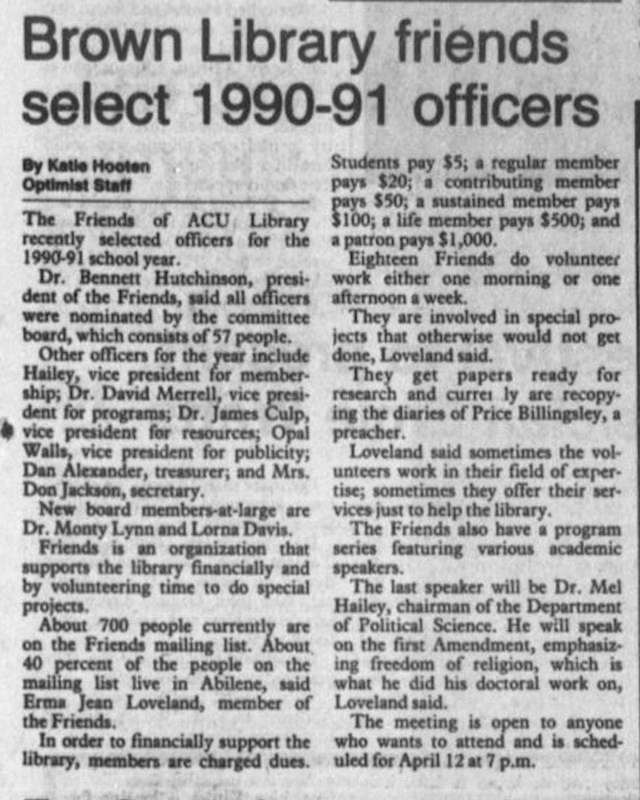 Walls was active in the Abilene community, including serving as the vice president for publicity for the Friends of the ACU Library board for the 1990-1991 school year. Page 7, Women of ACC. 1974. Women of ACC cookbook: recipes from members, ex-students and friends, and ACC specialities. Abilene Tex: Abilene Christian College. 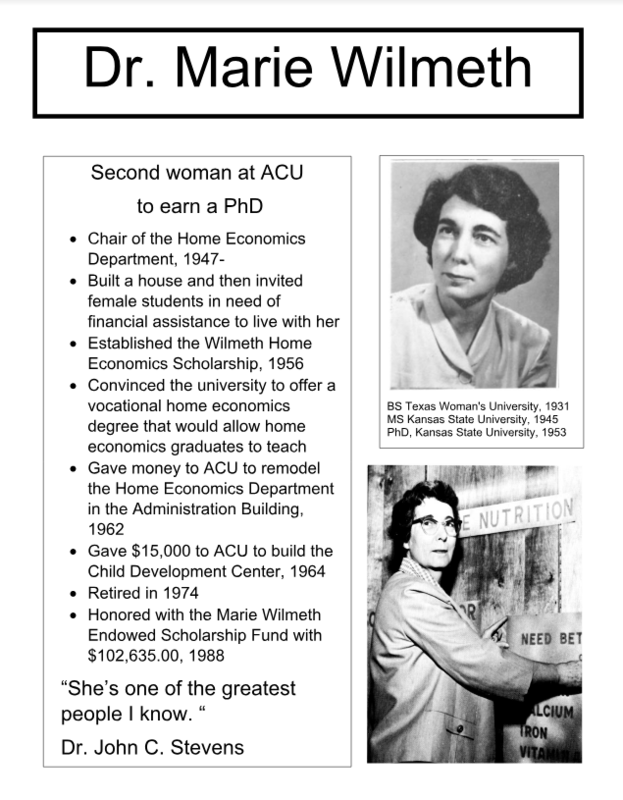 Blanche Walker was a member of Ko Jo Kai during her time at Abilene Christian College. She married Lefty Walker, pictured below. Abilene Christian College. Prickly Pear, Yearbook of Abilene Christian College, 1932, yearbook, 1932; Abilene, Texas, University of North Texas Libraries, The Portal to Texas History, https://texashistory.unt.edu; crediting Abilene Christian University Library. Page 18, Women of ACC. 1974. Women of ACC cookbook: recipes from members, ex-students and friends, and ACC specialities. Abilene Tex: Abilene Christian College. 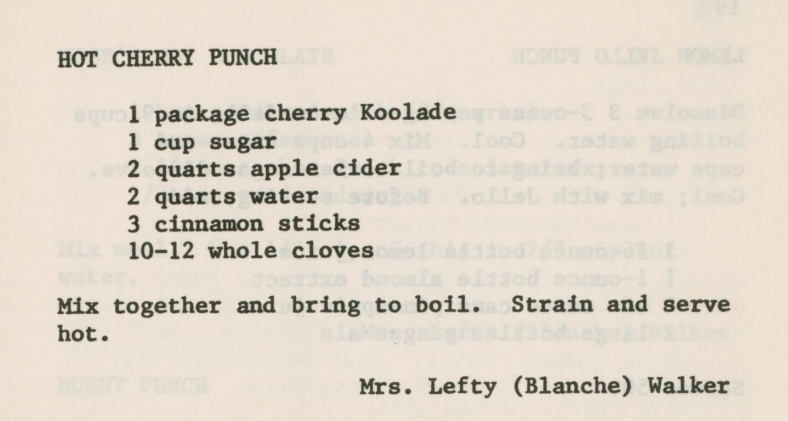 Check back soon for more recipes and history! #ACU1968: Foster Science Building is named in honor of Otto and Mattie Foster. 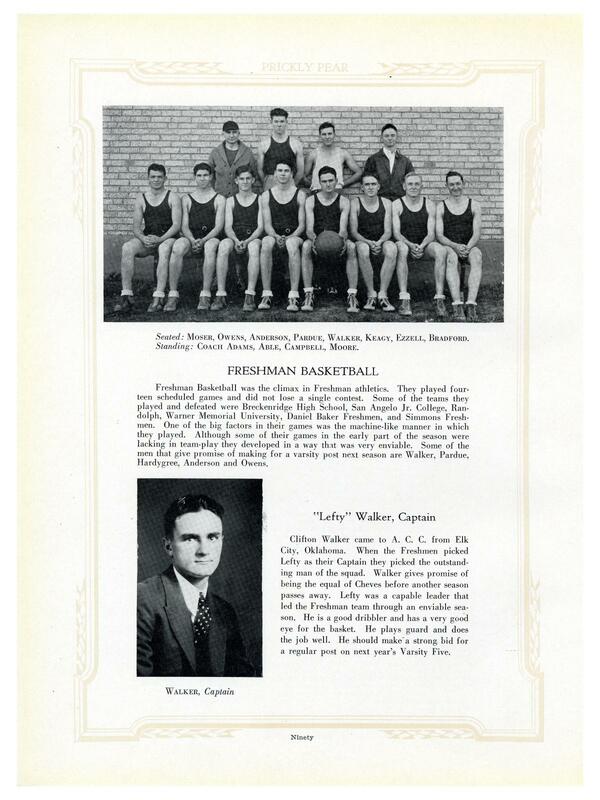 Otto was an ACC trustee from 1921-1927. The Ora Mae Curry Papers are ready for researchers. An updated finding aid and digitized selections from the collection are now available on DigitalCommons@ACU. Title page of scrapbook, box 1, Ora Mae Curry Papers, 1917-1921. Center for Restoration Studies MS #435. Abilene Christian University Special Collections and Archives, Brown Library. Abilene Christian University, Abilene, TX. Ora Mae Curry graduated from Thorp Spring Christian College in 1920. She taught history at Central High School (San Angelo, Texas), and attended Johnson Street Church of Christ (San Angelo, Texas). 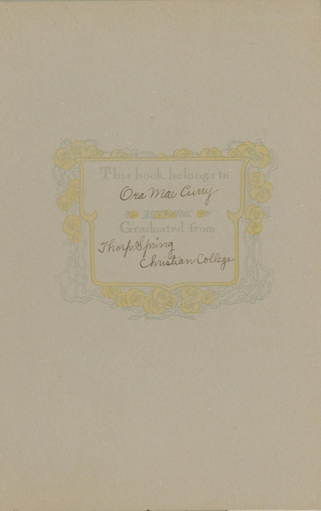 1917 Thorp Spring Christian College commencement program, Page 23 of scrapbook, box 1, Ora Mae Curry Papers, 1917-1921. Center for Restoration Studies MS #435. Abilene Christian University Special Collections and Archives, Brown Library. Abilene Christian University, Abilene, TX. 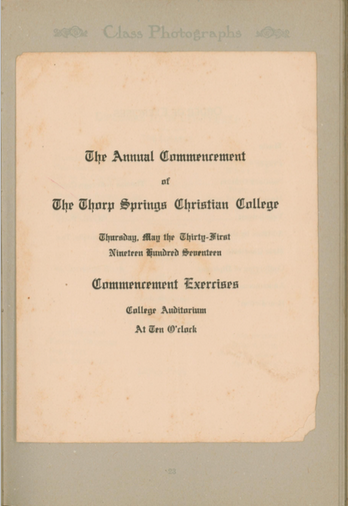 This collection includes one scrapbook from Ora Mae Curry’s time as a student at Thorp Spring Christian College (Thorp Spring, Texas). 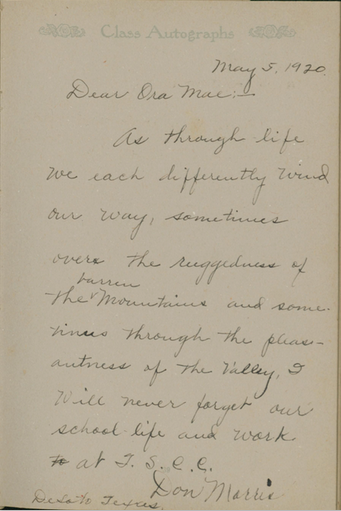 Note from Don Morris to Ora Mae Curry dated 5 May 1920, page 39 of scrapbook, box 1, Ora Mae Curry Papers, 1917-1921. Center for Restoration Studies MS #435. Abilene Christian University Special Collections and Archives, Brown Library. Abilene Christian University, Abilene, TX.